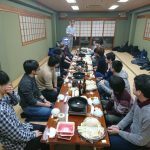 Welcome party as well as end of year party was held in Tentra restaurant on Dec. 17, 2018. Prof. Yiyu Shi (Notre Dame university) and special auditor student, Andregg Raphael (ETH Zurich) are currently visiting our lab. Over shabu-shabu dinner, we really enjoyed stimulating conversations. Cheers!